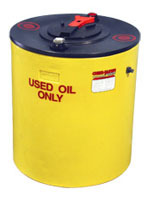 Looking for a safe place to store your used oil? An oil tainer is an easy, maintenance-free polyethylene container that can store either 100, 150 or 385 gallons of used oil. Its material consists of 100% recyclable polyethylene that is weather-resistant, unlikely to rust, chip, or dent, and can be cleaned with only soap and water. Manufactured with a double-wall that provides for 110% secondary containment, these plastic storage tanks are designed to provide you with efficient storage that won't cause you any safety concern. 100 gallons 35" X 41"
150 gallons 34" X 49"
200 gallons 41" X 53"
385 gallons 64" X 42"
Spill Pan 66" X 8"
Spill Pan 37" X 4"
This used oil storage tank is designed specifically for the storage of used or waste oil. Its features include several fittings and accessories that help to prevent spills and safely contain the liquid in the event of a spill. As secondary containment requires, these tanks feature enough space to provide for a full 110% containment of liquids within the unit. Automatic Overflow Shutoff: This feature automatically shuts off the flow when the tank is on the brink of overflowing. This can help to prevent spills. Debris Screen & Strainer: The debris screen and strainer for this tank is designed to prevent contamination of storage materials inside the unit. 110% Secondary Containment: The tank is also equipped to contain 110% of liquids stored within the storage unit. This helps to provide built-in secondary containment for your materials.